People use strategy map to describe their business objectives, strategies, and support their strategy discussion. Learn about strategy map best practices shared by our users. Our main aim was to get a product or platform that could help us manage our systemic growth using the Balanced Scorecard. BSC Designer provided us with that platform wherein we could enter all our scorecard information and delegate portions of it out to responsible parties. We found BSC Designer to be one of the few product that was very well organized and well thought out in terms of balanced scorecard implementation. The automated strategic map feature is a tremendous help. The product also allowed us to implement complex aggregations to roll out our scorecards at divisional and corporate level. Having worked with other products in this area, we found BSC designer easy to use and fairly intuitive even for our end user community who are participants in the scorecard adoption. Manish, thank you very much for your feedback. It’s really great that you are following the correct BSC methodology. Unlike other products we are not just providing the software platform for KPIs (that is just the measurement part of the Balanced Scorecard), but are also well designed strategy maps. The automated strategy map feature that you mentioned is one of the attempts to make software even more user-friendly. We know that one of the biggest challenges during the implementation of BSC is buy-in from all participants. With automated strategy maps we don’t require user to be professional graphical designer or to spend hours moving blocks around the map. Software can do almost everything automatically and the user can just introduce some minor changes. We are going to move ahead in this direction. In the new version of BSC Designer it is possible to work with strategic themes. Thus different business objectives on the strategy map have different color coding according to their strategic theme. Helping our clients to organize strategy and metrics using BSC Designer. Each client develops a Strategic Map. Using the provided wizard we can develop its metrics in an easy and practical way. A great and practical option is to deliver and keep a Balanced Scorecard. We are a consulting firm and use BSC-Designer regularly to help our clients to visualize their strategy and keep control of their vital metrics. BSC-Designer, both desktop and online solutions, are the best applications for our purposes. We highly recommend BSC Designer to any small and medium company that want to move forward in the implementation of its strategy in a systemic way. Thank you for the detailed feedback about using BSC Designer software. A strategy map is a great tool not only to present main strategic directions, but actually to measure and manage business performance. In the latest version of BSC Designer we improved the strategy map approach taking in account some requests from our customers. Here is a step-by-step instruction that shows the latest best practices about how to work with a strategy map in BSC Designer. For instance, we noticed that many customers used not just a business objective, but they also needed to add to the strategy map a lot of KPIs. It was possible in older versions, but now it is possible to align several KPIs with a business objective. BSC Designer will present this bundle on the strategy map providing information about current KPI performance via a stop-light indicator. Another note is that the process that you described implies that your clients use only a strategy map. I believe that your customers would have much more benefits if you can deliver the source BSC project to them, not just a strategy map. For the client it will be a possibility to work with KPIs, business objectives and to share their strategy with employees more effectively. You are right; among our customers are big names as well as small and medium companies. Small companies often don’t have a properly designed strategy. In this case BSC Designer software provides an easy to follow framework that permits coming up with a clear strategy quickly and visualizing it on the strategy map right away. As I mentioned above, with the latest version it is even easier now. Finally, I’m inviting you to check out the details of our partner program, if you prepare a strategy map for your clients, then most likely they will need BSC Designer software to maintain their strategy maps in the future. There are several opportunities for them to get BSC Designer. One option is to purchase a license for BSC Designer PRO that will be a one-time investment with optional upgrades; another option is to sign up with an account at BSC Designer Online, which will be paid monthly. I would like to thank you for a good product, which has made my job so easy. I think that this program is easy to work with and is very helpful for creating strategy maps. I especially like the Strategy Map Editor available in the software. I improved my Balanced Scorecard project with it. In my office we are concerned about HR scorecard and I can use BSC Designer to calculate and manage with HR scores. My job task is focused on Strategic Management, and the program makes it so easy! After I’ve installed BSC designer, and I would like to say that it is a very good program. Thank you again for introducing me to see the great BSC program. Thank you for your feedback. Here are some ideas that you and other visitors of our website might find useful. 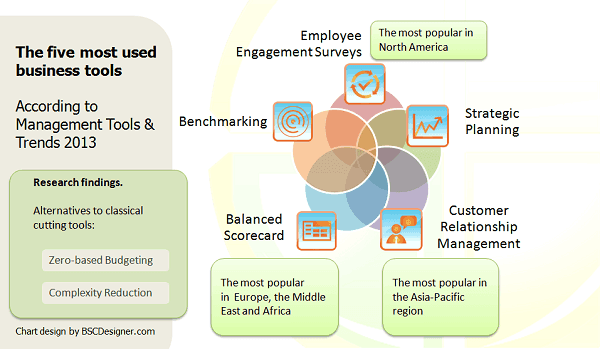 Regarding HR scorecard, we did a detailed research of the topic. Check out the KPIs that we recommend. It is not just another long list of pointless KPIs. Next to each KPI you’ll find a link to an article with more details. 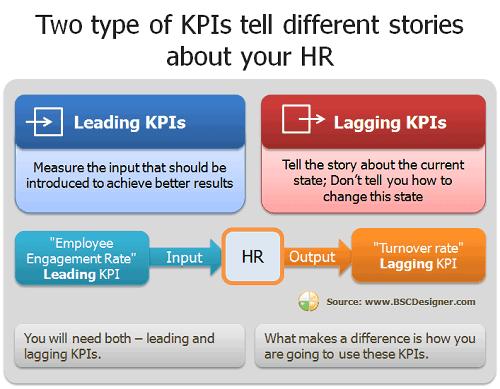 These ideas might be useful to improve your HR KPIs and scorecard. They are also available online in the BSC Designer Online project. Another question is how you plan to integrate the HR scorecard in an organization environment. An obvious thing is that it should use some data as input and it should report some information to the upper levels. One of the possible ways to do this is to use cascading. I was commenting another user feedback and we talked in details about cascading principles and how to do it in BSC Designer. Finally, don’t forget to upgrade to the latest version of BSC Designer. Strategy map editor was significantly improved there. Now BSC Designer will help you much more with an automation. It can convert your connected business objectives into a nice strategy map. As it is explained in this guide. With BSC Designer we are automating and documenting our strategic mapping. This software allows placing all important information in front of management. BSC Designer complies with Kaplan and Norton’s design of the Balanced Scorecard. In this software the scorecard implementation process starts by applying required performance measures and filling the gap between planning and actual improvement. In this way the right information is provided to the right people at the right time. BSC Designer supports a structure for implementing of the Balanced Scorecard system that helps to transform corporate data into actionable information and knowledge. Then it helps to communicate this performance information to employees. All together this helps people to make better decisions by offering an access to actual performance data. Thank you for your thoughts and ideas! 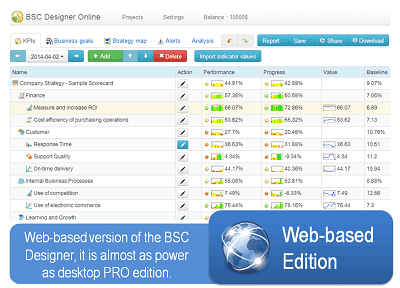 Users of the latest versions of BSC Designer have even wider opportunities to start with the Balanced Scorecard. For sure, they could start with measures, metrics and KPIs, but this is not an approach that works today really well. Simple metrics will work in an excellent way as a tactical dashboard, but they are not helping to create a coherent strategy that will help company to achieve its goals and objectives. We recommend to start with a strategy map. The idea is to map there major company’s objectives and show how they are linked to each other. In this way it is possible to see why something need to be achieved and how company is going to achieve this. Then comes metrics and KPIs. They will measure a progress towards set business objectives or simply monitor your current state. 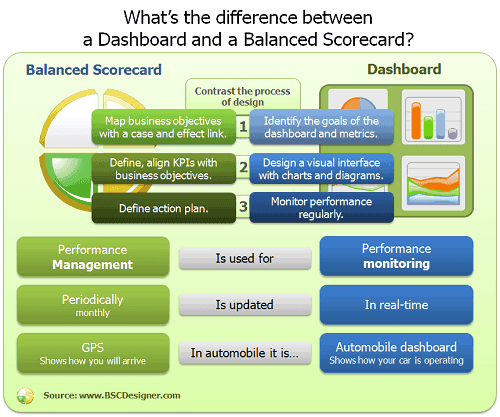 In this sense BSC Designer can be used as a hybrid of a dashboard and a strategy map. You mentioned that with BSC Designer decisions makers can have access to performance data. Actually, in this way they have an access to strategic information and action initiatives as well. Strategy is not only about what objectives to achieve and how to achieve them, it is also about why one needs to achieve them. In this sense, BSC Designer provides a view on different aspects of the strategy. As for daily usage of BSC Designer, it helps to inform involved team members about important changes. It is not just allows to communicate performance information in a form of various reports, but helps to notify team members about important changes. Use Alerts tab in both BSC Designer PRO and BSC Designer Online to create and manage notifications that you want to send to your team. For example, a person responsible for KPI can receive a notification when a KPI is in the red zone or a new initiative was added. We are using BSC Designer for restructuring the approach to local response mechanism in crisis prone areas in order to reduce risk and aid affected people. I have started to map out the framework of a strategy map. My role at the present is to propose options for a shift in strategy to position the organization to be more effective in responding to immediate crises and to aid public sector providers in sustaining service in stressful times. The link to the four perspectives is the most valuable insight, enabling me to present strategy options that are meaningful to all interest groups in the organization. Thank you for sharing a detailed feedback. I believe I can suggest some ideas that will help to use the Balanced Scorecard concept even more effectively. From your feedback I can conclude that one the main goals of your organization is to be able to respond to immediate crises. You are on the right track with creating a strategy map (by the way, with the latest updates in BSC Designer you will enjoy creating a strategy map in the software even more). The strategy map in your case will give a good plan towards improving the overall response of your organization to crises. Another aspect is that you need to monitor the current state of your initiatives. A more suitable tool for this purpose is a dashboard with important metrics. Actually, you can combine both approaches. We have a good article that analyzes these ideas. Moreover, with BSC Designer you can automate a “response mechanism” that you mentioned. Imagine, that you have some KPIs that help you to monitor the current situation. The software can automatically send a notification to persons responsible for a KPI, if the value of KPI got into the red zone. I need BSC Designer as a tool to help us define our strategy, communicate it, align resources and efforts, measure progress and make the necessary adjustments on strategy and/or targets to keep the things on track. We are now in the process of assessing our needs and align them with your product capabilities. In the next step we’ll have to define our strategy and quantify it in the BSC Designer software, according to the 2011 goals and objectives and taking into account the actual and future internal and external constraints. Strategy maps will be used to communicate the whole picture to the people involved in the strategy implementation. We’ll define the initiatives, indicators, etc. accordingly and align by these our internal resources. Permanent measurement and communication is a must to be able to make the right adjustments to avoid and correct the deviations and also to adjust the strategy and targets on the fly. My opinion is that all these aspects could be achieved with this software. Thank you for sharing your opinion. You are right about choosing BSC Designer fora specified task; the latest version of BSC Designer provides even more features that help with the defining of a business strategy and communicating it to involved employees. 1. Create a strategy map with business objectives linked by a cause-and-effect connection. Learn how. 2. Align action plans with KPIs and business objectives. Learn how. 3. Plan improvement of KPI values. Learn how. I find it especially challenging one idea that you mentioned. Logically, that once a company has a strategy defined, it wants to communicate it to the people involved, and to its employees. On the step 2 (Alignment) mentioned above, a company’s managers can find more details about how one can communicate the strategy to employees. 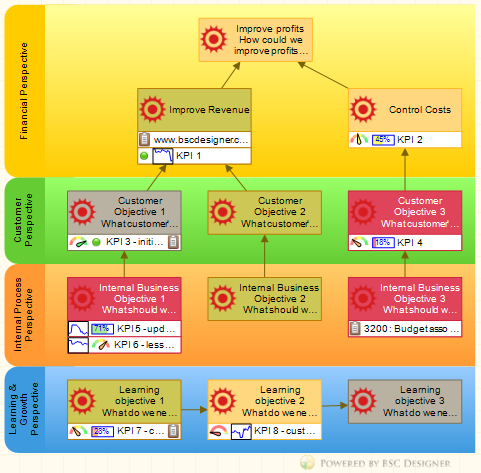 Begin with a strategy map with business objectives and KPIs linked to those objectives. Then use “Alerts” tab to create a notifications that will be sent to responsible employees when a new action plan is added. Similar notification can be sent to a manager when an employee attaches a report to a KPI. Ensure that the big picture is translated into smaller local strategy pictures. 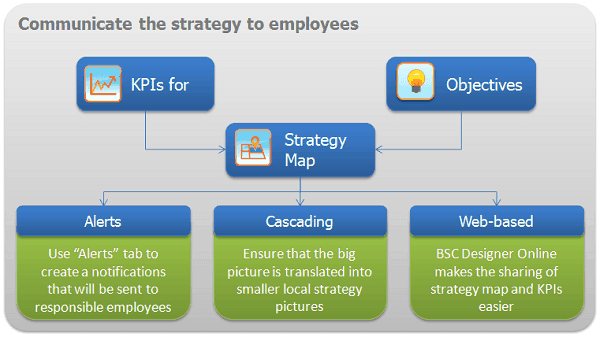 Each of the departments needs to have its own strategy map with its local objectives and KPIs. A web-based edition of BSC Designer now has all the necessary features to design and represent a strategy map, so managers can use it to formalize a department’s strategy. To ensure a cultural shift from “I’m doing my job” to “I’m helping my company achieve its business objectives,” make sure that all new activities in the company are properly represented on the strategy map. If not, then probably new activities are not aligned with a strategy and as a result will be useless. In the latest version of BSC Designer all users can enjoy automatic generation of the strategy map according to the principles of the Balanced Scorecard framework. Identification and definition of strategic indicators in the 4 perspectives. Definition of the strategic management model. Analysis, definition and incorporation of productivity kpis. With this tool we have defined the methodology by which the Management of our company we define the line of action strategy to achieve the mission and vision. The definition of strategic objectives. The establishment of relationships between the different strategic objectives. The identification and definition of monitoring indicators that measure the level of compliance with the objectives. The coherence of all resources (human, technical and budget) with the strategic objectives of the company. In addition, this program helps us to identify both the key aspects and the operational procedures to be carried out, the activities and departments involved and the tasks to be performed by them. I am a strategy consultant for blue-chip private sector clients, as well as public sector clients throughout Africa, the Middle East and North America. I utilize the Balanced Scorecard to ensure that clients implement their carefully crafted strategies. We live in an age where data needs to be turned into information which needs to be turned into knowledge and ultimately business intelligence (strategic wisdom). There are numerous Balanced Scorecard software packages around and I have reviewed many of them. I totally enjoy the BSC Designer as it has extensive functionality that provides an easy-to-use and visual method for allocating and viewing all of the key elements required for managing the Balanced Scorecard. Furthermore, it allows you to create excellent dashboards and reports which are crucial in rapidly being able to identify your areas of poor to great performance. I highly recommend BSC Designer to any company or consultant that uses the Balanced Scorecard methodology to ensure strategy implementation and monitoring. Thank you very much for your feedback. It is very important for us that our BSC Designer is recognized not only by business executives, but by professional strategy consultants. If someone recommends your software to others, such as to his clients, it’s a sign that we are on the right track in our development. I would like to continue discussing your thoughts about data, information, knowledge and business intelligence. We also live in an age where people experience information overload. Seeing many ads per day enables our information filters; the same happens when an executive see another chart or dashboard. When there is only key information on the dashboard, then it works very well. Anyone would agree that a dashboard should contain information, not data. What’s the difference? I believe that the difference is in the context. When executives have a KPI and it is not aligned with any business objective or action plan, then I would say that he deals with data, not information. KPIs need to have a business context. Another thought about a classical dashboard is based on the experience of our users. A classical dashboard is fine for operational management, but sometimes executives need to have a big picture of what’s going on, and a dashboard doesn’t help a lot in this case as it is not clearly aligned with a business objectives. To solve this problem, in the latest version of BSC Designer we have improved the strategy map. 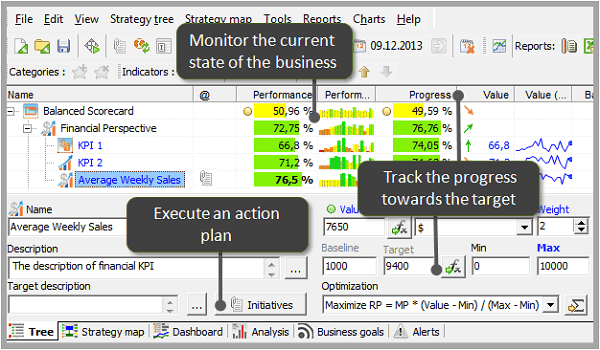 Now BSC Designer displays KPIs that are aligned with a business objective on the strategy map. That gives an executive a good big-picture view. When details are needed, a user can switch to KPIs or the Dashboard tab for more information. Wojtek Kwiatkowski from SONEL S.A., POLAND shares companies plans on implementing Balanced Scorecard Software. At the moment the company is working on the strategy for the next 3-5 years. We have chosen the BSC as the method of building the strategy and naturally are looking for the software or solution which can give us a better control over the preparation, implementation and further monitoring of the strategy itself. We think BSC Designer might be the solution we need – it focuses first of all on business indicators which describe the process. It is quite an easy software to learn, however we miss here the presentation of goals that can be easily understood by our employees. It is by far the powerful tool to work on strategy but to present and communicate the issue to the people we need anyway to use a separate software. Maybe a full e-learning course could explain how to use the software fully. I’m using BSC Designer for an implementation of the Balanced Scorecard. I’m evaluating BSC Designer as a product to implement, monitor and control strategy in a business unit. Also I’d like it to be web-based system that can be used in several parts of organization through the web, as well as the real time system is preferred for our company. Masoud, thank you for sharing your current progress about the BSC Designer implementation. I’m glad to let you know that there is a web-based version as well. It is available at WebBSC.com. And actually you don’t have to migrate there 100%. You can combine the usage of the BSC Designer desktop version, as well as BSC Designer Online. Design a Norton&Kaplan Balanced Scorecard. You will need to map your ideas about your company’s strategy. On the lower levels your business scorecard will evolve from top level goals and KPIs to the department-specific objectives and measures. Departments and top management will be able to use this business scorecard for further discussions about strategy, business objectives and the best way to achieve them. On a quarterly or monthly basis you can plan a performance review, when department managers will be able to report their metrics to the top level scorecard. Aggregated data can be then presented to the top managers and stakeholders. In this way they will be able to track the progress towards specified business goals. Needless to say, the BSC Designer will support you on all of these steps. Those who already have experience with these steps could share some additional thoughts in the comments. I started using BSC Designer and find it the most appropriate tool to implement and execute the strategy of our new born company: it is simple, effective, and easy to use. I think that cascading this system to the different levels of the company will show the maximum benefit of the software and will ensure alignment. I am sure that improvements in company’s goals will be achieved using this system. Thank you for choosing BSC Designer as a main software tool to support your strategy. As you know in BSC Designer the Balanced Scorecard framework is supported so that in recent studies it confirmed its high value in the tool box of executives worldwide. Also, we are trying to improve the software according to the latest requests and use cases with our customers. For example, according to your feedback you see the main role of BSC Designer as helping you achieve specific business objectives. What happens when your objective is achieved and the progress indicator is now at 100%? The next logical step is to keep an eye on performance of certain indicators. That’s where the task of performance management is converted into the performance measurement. We were talking about the difference in this article. You have the right idea about cascading. Ideally, each department should have its own strategy map. BSC Designer supports this approach. The general scheme would be to create a separate BSC project for each department and then import some important indicators to the main scorecard. Another note is about alignment. You mentioned that ensuring alignment is one of your priorities. As an expert in business performance I find that the term “alignment” is misused by many business writers. Alignment is anything from a simple list of items to tree-structure of dependent elements. In BSC Designer we support alignment of action plans, KPIs and business goals and here how it looks like in the practice. BSC Designer helped me to define strategy that I used to improve my business: understanding the way I should serve my clients and how I have to direct my efforts. Despite the complex concepts behind the BSC, BSC Designer is an intuitive tool that can lead the user step-by-step from the definition of KPIs to shaping their strategic map. The wizard is a friendly tool, the tutorials are easy to understand all of its facilities and features help to shape useful and powerful software. Thank you for your feedback! BSC Designer in this sense is just a type of automation software that allows business professionals to formulate their strategies, measures and actions. On our website you can find articles about various business frameworks that can be used to plan and execute strategy. A business can choose appropriate framework according to its goals. The Balanced Scorecard framework in this sense is a universal one. Talking about the BSC process… The classical approach suggests starting with business objectives first and then moving to KPIs. For sure there are some cases where business people have to start with KPIs. In BSC Designer we promote the approach where KPIs are developed in a business context formed by business objectives and where KPIs are aligned with specific action plans. But we don’t force using this exact approach. One can focus on KPIs only or come up with a series of maps that will help you to see the big picture. The BSC Wizard that you mentioned helps you to follow the BSC approach starting with business objectives and suggesting KPIs. As an alternative that we recommend one can use a Balanced Scorecard template that you will see when starting a BSC Designer file. There are some blank KPIs and business objectives that one can customize according to his or her needs. We are using Balanced Scorecard, dashboards and KPIs for consulting, training and educations for latam companies. The planning process does not end when the company decides what strategy or strategies to follow. One must transform the strategy into action. This translation is much simpler if managers and employees understand the business, feels part of the company, and through the involvement in the formulation of it, it helps the company to be successful. Deployments affect the organization from the top to the bottom, and impact on all areas, functional and divisional. The implementation phase is the key. However, it’s easier to say than to do. Implement the strategy is the act of turning words in action. It is the ability to manage people and resources to achieve the objectives outlined above. This step is so important that, even though, an excellent strategy had been made, poor implementation could put you at risk. The techniques and control systems are essentially the same, either to control production processes, administrative procedures, quality of a product or other. The faster deviations are detected, more easily and cheaply and corrective actions can be taken. That is why the importance of measuring, from the beginning, any type of process is necessary. Planning and control are increasingly treated as an interrelated system. Performance is, theoretically, a multidimensional variable that expresses the degree of success or failure of an entity in relation to another or, itself at an earlier time. The wider and more comprehensive set of performance indicators show the better part of the process of monitoring and control the business, and consequently, have a better capacity to respond to the challenges of a competitive environment. The BSC is the answer to it. Management needs measurements. In order to measure, it must be quantified, and hence, the importance of the Scorecards. It’s much better to evaluate the organization’s performance from other perspectives beyond the financial ones. It has its benefits. Those perspectives should be balanced. Balanced between financial and non-financial indicators, between the short and long term. BSC Designer offers all of those benefits, and is a suitable software tool that facilitates the construction of reports and professional presentations turns management into a practice of excellence. Electronic Engineer, Universidad Tecnológica Nacional, Argentina. Professor in Strategic Management at Universidad del Salvador, Buenos Aires, Argentina. 20 years in tech companies. Thank you a lot for sharing such a detailed report. You formulated the essence of the strategy execution problem. Not strategy planning, but strategy execution is what causes the most problem for companies. Even well-formulated strategy can fail due to poor execution. An execution in its turn depends a lot on how good the ideas about strategy are translated from top levels down to lower levels of company. That’s probably one of the major challenge that the Balanced Scorecard business framework addresses. A lot of articles on the Internet inspired by BSC tell that the strategy should be balanced, but what does this statement actually mean? First, other perspectives should be taken into account. If a company thinks only about finance, then it will be losing its focus from what value it is supposed to deliver to its customer. Second, business objectives within those perspectives should not be a standalone business items, they should be linked to each other. That gives the big picture of what’s happening in the business. In your report you described in details the process of performance monitoring, its importance cannot be overestimated, if something goes wrong and a company knows about this promptly, then a lot of possible problems can be avoided. 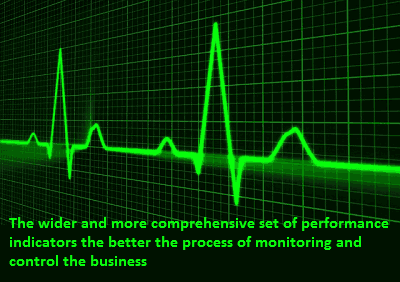 Having performance monitoring is great when the strategy of a company is to keep doing what they are doing. When it comes to an innovative strategy, then we are talking about progress tracking. Company’s KPIs won’t track in this case something that we already know well, instead result-oriented KPIs should be used. We were talking about this in an article on BSC Designer. By the way, this is another side of “balance,” when the BSC includes not only KPIs for monitoring, but KPIs for progress tracking. 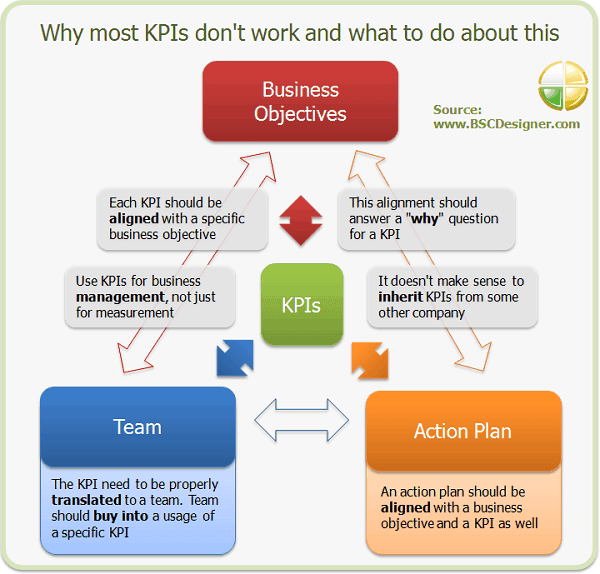 Another question that is actual for many companies is about the correct number of KPIs. Some say that there should be just few KPIs, other suggest to take a long list of KPIs and use it. The problem with long lists is that they don’t work. It is really hard to update and keep an eye on many KPIs. The better approach that we have discussed is to start with business goals and objectives first and then come up with KPIs that will monitor the performance or track the progress towards company-specific objectives. In this way the increase of the number of KPIs is natural and KPIs will serve you much better. I do appreciate finding this product on the market as it helps me to design in an easy and rapid manner some BSC for client. 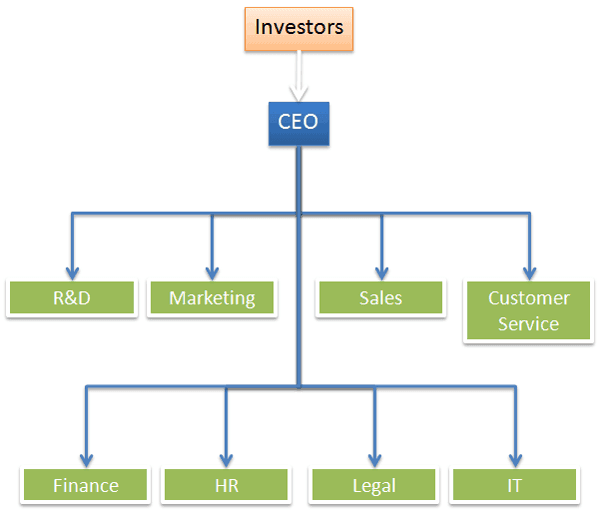 The balanced scorecard tree and the strategy map are designed very quickly; the product is able to merge several indicators under categories and to develop a multi-level BSC. Targets, weights and stop lights are flexible and the predefined representations are very expressive for my clients. At the end, the reports are automated and the import/export functions give me a lot of ways to proceed. I do particularly like the export to html that gives me the opportunity to publish reports on Intranet sites. BSC Designer is a simple and powerful tool that responds exactly to my demand. Sylvie, I thank you for sharing your feedback. It’s nice to see that performance management experts like you appreciate the software and find it easy to use. When we started designing a first version of BSC Designer back in 2004, we realized that there was already some professional BSC software on the market, but all of them were too complicated, even for experts. Needless to say that top managers use tools like this just because they are obligated. Another type of software was one with drawing tools, with no actual BSC automation. Taking all of these facts into account, top managers and business performance experts had to use some tools that were not really suitable for the Balanced Scorecard. I saw BSC designed in MS Excel or even in MS PowerPoint. Nice attempt, but with these tools top managers are focusing on drawing, not on managing. I hope that BSC Designer in this sense has helped a lot, being that it is an easy to use and user-friendly program. In your feedback you mentioned multilevel KPIs. That’s really a useful feature. One more thing is that not only KPIs can be multilevel. BSC projects can actually be multilevel as well. In the Balanced Scorecard this process is called cascading and for sure, BSC Designer supports it. Also, you told us that you were using reports to share valuable BSC information with your clients. The most popular are HTML, Excel and PowerPoint reports. Talking about reports, BSC Designer can help you to automate a process as well. A report can be generated and uploaded directly to the FTP server of your client. In this way you can just give out a link to the report without a need to exchange emails and report files.